Easily installed, low maintenance propulsion system that has increased performance, fuel efficiency and speed utilizing optimum propeller diameter. Propulsion Systems Inc was founded in the late 1980's but the concept dated much earlier by the inventor, Harry L. Schoell. 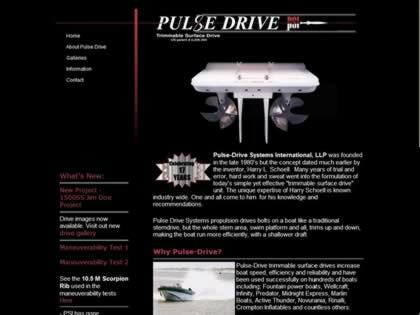 Web Site Snapshot: If available, above is a snapshot of the Pulse Drive web site at http://www.pulsedrive.net/ as it appeared when this site was added to the directory or last verified. Please Note that Boat Design Net has no involvement with the above web site; all content and images depicted in the above thumbnail are the property and copyright of Pulse Drive unless otherwise noted on that site. Description: Easily installed, low maintenance propulsion system that has increased performance, fuel efficiency and speed utilizing optimum propeller diameter. Propulsion Systems Inc was founded in the late 1980's but the concept dated much earlier by the inventor, Harry L. Schoell.